The show for December 26 is cancelled due to the crash of the Ministry of Defense’s Tu-154 into the Black Sea. President Vladimir Putin declared December 26 day of national mourning. The Dvortsovaya (Palace) Square will be the stage for the “Let’s fly into the New Year” light show dedicated to the Year of Cinema that’s being celebrated in Russia in 2016. Despite the fact that many episodes will be based on Soviet movies scenes which you might not be familiar with (as well as many younger Russians), it’s anyway worth visiting. 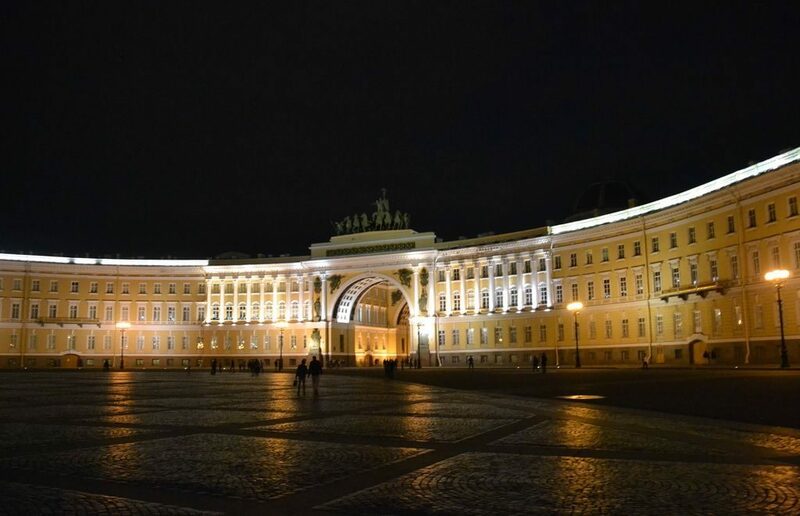 The “screen” of the light performance will be placed on the walls of the General Staff (cover photo), a building jointly occupied by the State Hermitage museum and the Russian Army. Images of the Bronze Horseman, the emblematic monument of St. Petersburg, and Sherlock Holmes (yes, that one, from the Baker street in London) will link two separate parts of the show. The first one, “Dream in the Summer Night”, will feature novels about Christmas and New Year’s nice dreams of a little boy with classical gingerbread houses and sweets. The other one, “A love story of suitcases” is about the meeting of two suitcases at the Pulkovo airport and their further trip throughout Russia. The 40-minute show will be repeating non-stop as of December 20 to December 30 from 18.00 to 23.00, except the last day, December 30, when it will end at 22.00. On December 30, visitors will see another great show just after the end of the light performance – a 15-minure big firework in the Neva river aquatorium best seen from the Dvortsovaya embankment, Mytninskya embankment and the Spit of the Vasilievsky island. What’s important is that the weather is predicted to be rather warm these days with 2-3 degrees above zero Celsius with possible little drizzling. Our recommendation based on visitors’ reviews: worth visiting. You can see Light Show At Palace Square which was in 2015.